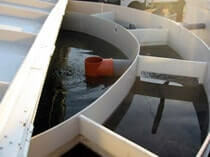 The compact, “one-tank system” wastewater treatment plants from AT30 to AT300 are comprised of a single vertical cylindrical tank, made from polypropylene - the biological reactor. The biological reactors can be transported ready-for-use by oversize transportation truck “convoi exceptionnel”. 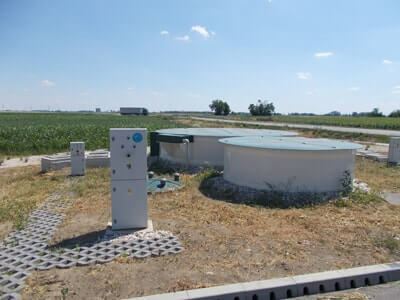 The range of small wastewater treatment plants from AT30 to AT300 is designed for decentralized and semi-centralized solutions of wastewater treatment in the range of 3.8 up to 45.0 cubic meters per day (30PE-300PE). The small wastewater treatment systems comprised of the biological reactors from AT30 to AT300 can be gradually expanded up to the capacity of 135 cubic meters per day (900PE) by installing several units in parallel. AT 30 to AT 900 wastewater treatment plants were invented to purify sewage water for blocks of houses, small villages, parts of a village, accommodation properties, restaurants, recreational properties, manufacturing factories, industrial parks, meat processing factories, dairy factories and slaughterhouses. Furthermore the purified water can either discharge into the surface or underground water, respectively it can be reused for irrigation. AT30 - AT900 wastewater treatment plants are delivered as a complete technological line consisting of one or more plastic biological reactors with a circular ground plan, a pump station with a mechanical pretreatment and a sludge tank. The treatment technology ensures the high quality of purified water, low investment and operation costs. The technology also can be found under the international name of Vertical Flow Labyrinth - VFL. Very small footprint due to patented Vertical Flow Labyrinth VFL®. 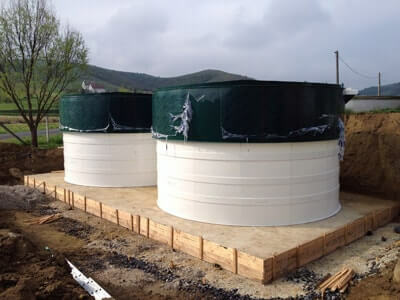 Quick and easy installation of wastewater treatment plant. Modular and expandable up to 900PE wastewater treatment plant. The pressurized air is supplied by blowers for aeration of the activated sludge chamber and for recirculation via air-lift pumps. The recirculation and aeration is controlled by a microprocessor control unit which also enables the wastewater treatment plant to work in various modes depending on the loading. The quality of purified water corresponds with the Directive No. 269/2010 requirements in the Collections of Laws for discharging the water into the ground or on the surface. 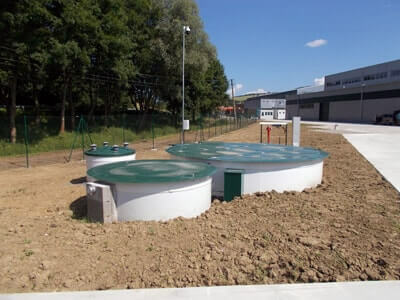 AT30 - 300 biological reactor and the sludge tank are installed as partly underground tanks on the concrete base slab (thickness 200-300 mm) allowing the top edge to protrude 1000 mm over the surface. The tanks max. depth without additional static support is 2000 mm. When deeper placing is needed or if the project documentation requires it, there is a necessity to put a concrete around. Before doing backfill (sorted material or concrete) the tank must be filled with water up to the outflow pipe. The detailed instructions for wastewater treatment plant mounting are listed in the Operation Manual.